It's good to see that not everyone conforms to politically correctness and The Hangover: Extended Uncut on Blu-ray is one of those movies that thankfully does not. Directed by Todd Phillips, he brings together a motley crew of friends who have arranged to celebrate or mourn their friend Doug's upcoming marriage. Almost hijacking him to Las Vegas, this bachelor party begins with a grand plan of drunken debauchery but unfortunately something goes wrong when they decide to go a bender with drugs and booze. As they awake the next day, they realise that the bachelor is nowhere to be found and they have only 48 hours to find him. To compound the situation, they awake to a tiger in their bedroom, have a run in with Mike Tyson and discover that there is a 6-month old baby in their room and no one remembers what the hell happened. Trying to piece together what happened, the groomsmen attempt to put the jigsaw puzzle together that leads them to strippers, church and even a Chinese gangster in this hilarious movie about a bachelor party going wrong. With some great one liners and an eye brow raising scene involving the baby, The Hangover is definitely not for those who enjoy "proper" British Comedy or so say the ladies of Laddettes to Ladies. 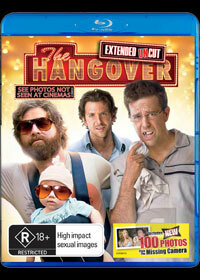 With some great acting Bradley Cooper, Ed Helms, Zac Galifianakis, Justin Bartha and the delightful Heather Graham, The Hangover features comedy and even some mystery that looks brilliant on Blu-ray with stunning surround sound. Best of all, this "uncut" version of the movie features some never before seen footage and some great featurettes that will also have you in stitches, especially Ken Jeong's Non-stop Hilarious Improv...Brilliantly funny! The Dan Band performs "Fame"
BD Live - "Cursing Mash-up" with all the cursing in the film! BD Live - Mike Tyson's hilarious rendition of "In The Air Tonight"